Atomic pulled out all the stops for the new Backland series of touring boots. This figurative expression not only refers to pipe-organ knobs, but also to financial constraints, production impediments, and reasons that may stop you from buying them. This includes the most common reason for not-buying a ski boot: poor fit. With a unique heat-moldable shell, the Backland Carbon boots may fit just about everyone. Carbon reinforced Grilamid shell transfers power throughout the flex. Free/Lock 2.0 is a simple transition lever that doesn’t interfere with crampons. Platinum Liner is breathable which helps to prevent blisters. Also washable. Memory Fit heating process allows you to adapt the shell to your foot. Quick Click tongue lets you walk freely and then add stiffness for the down. Carbon spine and removable power strap further increase the performance. Skywalk rubber sole is grippy and appears to be reasonably durable. Cross laces and support zones in the liner brace your calf, ankle, and shin. Update for 2017/18: Atomic updated the color scheme and added a handy pull tab on the ski/walk lever. How do the fit of these compare to the Dynafit Speedfits? Max, The Backland has a 98mm last , so is considerably narrower then the Speedfit. They also have a snug heel pocket. These took me a little while to get dialed in but i really enjoy them now. I initially had a lot of rubbing/bruising on my inner leg just above my ankle on just my right foot only while skinning and walking. I had the liners molded to allow for extra room here and also had both inner ankles punched out and ground down a bit. The boot fitter i went to mentioned that the rubbing i had was common for this boot. My rubbing persisted until i figured out that while skinning and walking i need to have the tongue out and the top buckle on the tightest notch possible. I think this is what the manual describes so I should have just RTFM. I cannot skin pain free with the tongue IN but the range of motion and lack of resistance without the tongue is so good that I have no interest in skinning with the tongue in. I really like how supported my leg feels while skinning. I skied a few days on some TLT7s but didn't like how unsupported my ankle was as compared to these. Downhill performance is good. I feel pretty locked in even though the liner height is significantly lower than on the scarpa maestrales i'm coming from. I really wish there was a spot for clipping a binding leash but i see that's been addressed in the new model. Interesting. Seems to be a similar spot as the one that is giving me problems. Following up on my last post, I noticed that the bottom and middle eye lids of the liner are very far apart. This results in an outside folding of the liner with every step. The the liner fabric is compressed between the shell and my ankle which seems to be the cause for my ankle bruise. Compared to my old tlt6 liners the eyelids are about one inch further apart. Has everybody else observed this? Hi Steph! Interesting, none of us use the laces so haven't noticed that particular problem. I bought these boots to replace my TLT6. I have a narrow foot and they seem to fit me much better than the TLT7 which are much wider than the TLT6. While they are light, climb well and and are sufficiently stiff for skiing I am having several issues with them. I had the shell fitted (by a non Atomic boot fitter) but I am still having a lot of pressure on the inside of my ankle, even immediately after putting them on, resulting in bruised ankles. Strangely this doesn't happen all the time. There have been plenty of real long days where they fit super comfortably and I had no issues what so ever. Not sure why it differs so much from day to day but this issue has been so bad a couple of times that I got to a point where I am considering using those boots. Also I find the buckles extremely fiddly and they seem to open easily when hitting on firm snow or rock while boot packing. I never had that issue with my TLTs. The inserting the tongue and the transition from uphill to skiing mode also is quite a bit trickier than with TLT6. Also one gotta take care that the gaitor doesn't get stuck between the tongue and the shell otherwise the lower buckle doesn't close completely. Wondering what size I would best fit into. I currently ski a 27.5 MTN lab and cochise 130 in a 27.5, those both fit well. The BSL looks to be quite a bit shorter on the backland, should i jump up a shell size to 28? or do yall think a 27.5 would be doable? Hi Peter, the BSL is not the best indicator of internal length with touring boots. You should be the same size, 27.5. The durability of gaiter seems to be lacking. I am using intuition pro tour liners so that could play a role as well. Any suggestions on how to replace the gaiter or fix it up? It seems to be glued to the shell. Duct tape doesn't seem to be a good solution as it needs to bend in too many directions. Hi Nick, that's definitely a big liner for this boot! Might be adding some stress. Some nylon patches or similar might help. Or an external gaiter over top of the boot. I am thinking about up-sizing to a 29 from a 28.5. Do you think I could swap the cuffs between the two shells if need be, or are they size specific? Hi Chris, that's an interesting question. You might be able to do it, but we don't have any data on where the sizing changes to confirm for sure. I never could find a way how to ski in them. They are plenty stiff with the tongue, the support is not there though. Might be because they are VERY low(and i have smaller feet for my height), but plenty time had a feeling like i could just fall out of the boot or even break my ankle(?!?). OTOH pull out the tongue and the skinning is incredible, very close to a race shoe. 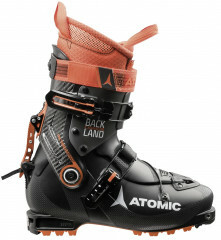 Atomic seem to make the shoe without significant changes years in a row now, so might be just be mine issue. Hi jenda, it sounds like these were a poor fit for you; the instep is a bit on the high side which is likely not good for your foot. Hey guys I just picked up a pair of these for a future “light” ski tour set up. My current skis are mounted with kingpin’s . I have read a lot of back and fourth about the compatibility. I do not plan on skiing them with kingpins in the future but until then I wanted to try them out a couple days and all I have are the kingpins. If somebody can clear up the compatibility issue for me that would be great. Hi Cody, the Backland Carbon is not Kingpin compatible out of the box. You would have to add a Kingpin heel adapter to make it work. After 8 seasons in the Dynafit TLT5 and 6s, I was ready for something comparable in performance but that didn't develop so much slop and play in the cuff rivets and walk mode. I didn't like the direction Dynafit took with the TLT7, so this season I gave the Backland Carbon boots a try. So far I am really pleased. The stock liner left my low volume foot swimming a bit, so I used the Intuition Pro Tours I had been using in my TLT6s. I molded the shell at home in my convection oven...I didn't get too aggressive with it as I was a bit nervous about DYI but successfully alleviated some of the mild pressure points I had prior to molding. The cuff pivots and walk mode lock are the most solid I've seen in a boot of this genre. Time will tell, but after ~20 days they are still super solid in ski mode and from what I understand the serviceable cuff bushings are quite durable. They tour better than the TLT6 since there is no plastic tongue of any sort to restrict forward motion, but you do need to use the removable tongue for acceptable downhill performance. It's a bit trickier to insert than on the TLT6, but I found grinding the tab down made it more friendly. Some might find all the buckles and removable tongue fiddly compared to some one-lever style boots out there, but for me an extra 30 seconds during transitions is well worth the added performance. In downhill mode with tongue inserted, the boot skis at least as well as the TLT6 - a level of stiffness more than adequate for my 190 pounds and driving bigger skis in variable snow. Do you climb in this boot with the tongues in, or do they have to be removed? Hey Mark, it kind of depends. Most people remove the tongues to tour with but pop them back in on the way down. I have heard of people touring with the tongues in, but it definitely doesn't work out quite as well. If you want to tour with a tongue, the soft tongue has had a lot more success there. Realistically, how wide of a ski can these boots ski well with? If someone is going to be looking for a solid uphill performer that skis a lot of powder and soft snow are these a solid choice? If these aren’t a good choice for a ski in the 95-100mm range, what other boot options that have a wider forefoot would be worth considering? Hey Tom, thanks for reaching out! I think this is would be a great choice for an all purpose touring boot! The forefoot in the Backland isn't necessarily super wide to begin with, however it can be punched out/molded to be by far one of the widest boots on the market. The Dynafit TLT7 is definitely another option that's pretty wide to begin with and has some similar uphill/downhill characteristics that the Backland embodies. I know this is an old post, but I've skied these boots with Helio 116's at 186 with no problems in the Sierra backcountry. Like the boots after a few (long) days. I do want to switch the liner to something taller and a bit beefier though, Intuition Wrap or Protour. Would like a bit more support fore/aft (added boosters already), and got cold feet on windy days (thin socks). Never had this issue on my previous Scarpa Maestrale RS. No shop around to test for size, so hoping someone here could help. What size Intuition liner should I get? Hey Jvr, The pro tour liner will beef up the boot and not affect the walk as much as a wrap liner. 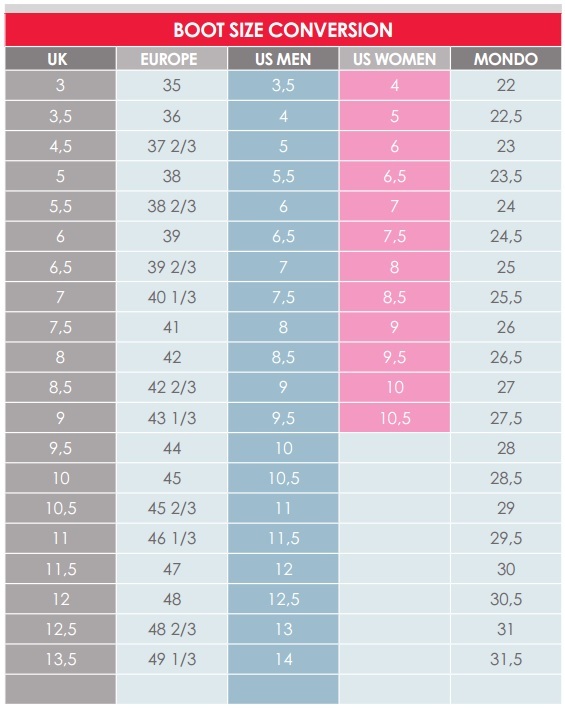 We measured the liners and the 26 liner will be a match for your 27.0 shell. The Medium Volume will add some thickness to whole boot, thusa taking up more room. The Low Volume will be a more similar volume to your stock liner. I have a similar issue here; size 25 - 25.5 backlands, would like to take up some volume. I'm concerned about a size 24 liner, since I've never skied something that small before and my foot measures to 25.3 cm. However that is mostly one freakishly big large toe. Would this mold correctly if I have a standard 2 finger shell fit with these boots? My alpine boot size is 24/24.5, but with the 24.5 liner. The alpine boot fits extremely well, and maybe has a tiny bit smaller shell fit. Piotr, I just measured the 25 Protour liners to one of our 25/25.5 stock liners and the Protour was a little longer again. The 24 Protour is the same length as the stock liner. Generally the rule of thumb is matching the Protour to the stock liner and if they are the same length then the volume will be very similar after molding. You would just use the Medium Volume over Low Volume depending on the amount of room you need to take up. Although with that said the Low Volume liner will snug up the fit over stock liner, where the Medium Volume liner will take up alot more volume than stock. Thank you for the thoughtful reply! I really appreciate it. Does anyone happen to know whether they can be resoled? Thanks. I have a good friend who owns a climbing shoe re-sole business. I've asked him about resoling ski boots and his reply was that they would be very easy to resole, provided one could find the proper sole material. Last we spoke, he still hadn't sourced the material. If you can find it, I'm sure you could get someone to do it. Hi, im about to order but have no chance to try them on anywhere nearby. Scarpa F1 27.0 is perfect fit, Spitfire 26.5 is tight but good..after few hours in them i belive it would be super fit as well. Also Scott Celeste 26.0 seem ok. So far i have been on Syborgs 27.0 for two seasons. Lately it started to feel really lose in the forefoot (i guess liner needs replacing). So its obviously 26.5 or 27, but thats where the size breaks so it might feel quite a lot different. Might trying atomic alpine boot help sorting this? Hi Johnny, you are most definitely a 26/26.5. You likely won't even need to mold the shell, but there is always that option if it does end up a little snug. Is there any difference in the shape of the shell or liner between this and the women's version? I.e. if I want to have a stiffer boot and don't care about having girly colors, would I get the same fit with this as with the women's backland? The fit should be the same between this and the women's version and definitely should provide the stiffness you are looking for. any idea on fit (length wise) of these? I wear 42 cycling shoes, biggest foot is 267mm. Flat, low volume foot. Hi Kurt, you'd likely get a really good length fit with the 26/26.5, but these aren't the best for flat, low volume feet. Visit our boot fitter for more options. About me: 6', 180lbs, 11.5 shoe size, 29.5 in this boot. Wide forefoot, narrow heel. Skied one day in this boot before heat molding. Mostly used with a Fisher Hannibal 94 177mm. Lots of good info already in reviews here, but I wanted to leave another long term data point. I have been using these boots exclusively the last 12 months, and have skied every one of those months. They have held up very well to all of the rocky, snow covered approach scrambles, as well as cold, long days, and deep pow turns. I appreciate the simplicity of the boot design, which has made, for instance, replacing buckles and such straight forward. I would recommend loctite for critical screws once a season. The tech interface has held up tremendously, as have the soles. I really like the way these ski, and for my usage, they are downright excellent in terms of balance between weight and performance. Used on steeps, multiday hut to hut trips, and every day touring. Admittedly, these fit my feet really well, but I have seen these more and more in the backcountry and I believe that is due to the ability to heat mold the liner to a shape that will work with many people's anatomy. If you are looking for a single light boot for backcountry use, this one should be at the top of your list. I am curious (baffled) by how the heat molding process works on the shell. Is it one step or do you mold the liners first like a traditional boot fitting to see if the shell even needs adjustment. Seems odd to heat mold the whole shell. Any experiences good or bad with heat molding these shells? Hi Patrick, you can basically stick the whole thing in an Atomic oven, liner and shell. Of course, not everyone needs the shell to be customized, it is a judgement call whether to do just the liner. It seems to work well overall, and can adapt to some wider feet. I have a question about the BSL for these boots. I have a pair of Skimo skis with Dynafit Superlight 2.0 mounted for the original TLT 5 (Mountain), size 28.5. I would love to replace my old TLT's with the Atomic Backland, but of course the binding isn't adjustable. What I'm wondering is whether I might be lucky and they might just fit anyway? The BSL for a Backland in size 28.5 is exactly the same as the TLT. But is the distance between the front and back tech fittings also the same? Hi Eric, the BSL for the Backlands is 1mm longer in each boot size. For a 28.5 it's 307 (TLT5) vs 308 (Backland). You'd be shrinking your gap a bit. Thanks, that's good to know. But ... does the BSL actually reflect the distance between the tech fittings? I figured it means the difference between the front of the toe and the back of the boot, which is a bit different. You figured correctly Eric, the BSL is a sole measurement, not the tech length. However tech fittings are offset from the sole ends by a somewhat standard amount (except when they aren't). Thanks. So the implication is that I probably need to actually try this to be sure. I will have to crab a pair from a local shop and check it out. But I'll still order stuff from you guys for your trouble if/when I figure out what to do next! Hey Eric, I'm happy to test this out for you when we get more Backland 28s in stock in a couple months. Thanks, happy to take you up on that (NB: 28.5 is what I am interested in). I would have the same question about the Scarpa F1 (new manual model) when you have them. Hi Eric, the 28/28.5 Atomic measures almost exactly 2mm longer than the TLT5 28, so you will likely need to remount with adjustment plates. The F1 is way off as well.